For the Individual Electoral Registration project I've been out and about doing user research around the UK. These pop-up research days are fascinating, frustrating, scary and fun. However much I plan, I never know exactly what I'll find when I get to the location. But I always learn so much about our users and our services. Our project is aimed at around 47 million people who are eligible to vote in UK elections. They have every level of experience and confidence using digital services, and a wide variety of personal circumstances that can have an impact on their application. And we have a particular focus on those who are less likely to be registered to vote, such as young people, people with disabilities, people from ethnic minority groups, homeless people, and people living in communal accommodation. Pop-up research is a great way to reach all parts of this broad audience. My ideal location for a pop-up research day is one that is busy all day, and that members of a particular target group are likely to attend. On the day I put up two large, colourful banners to attract attention. One for the entrance and one for the spot where I'll be doing the research. I also put out A4 fliers with a design that matches the banners. For the research, I look for a corner where participants will feel comfortable, but where passers-by can see me running the research. As well as helping to recruit more participants, running the sessions in a busy location creates a realistic and challenging test for our service. We know that people access our services on a laptop at a kitchen table while their partner is making a meal. Or on their phone on the train to work. Or sitting on a sofa while their family are watching TV. So I love seeing how our service works in a similar situation. Passers-by rarely have much time to spare, so I focus on one or two important tasks or questions. And I keep the research activity short, ideally 10 minutes, but no more than 20 minutes. To keep the technology setup simple, I use just my laptop on a table with two chairs and record sessions with the laptop camera and microphone. I also take a mobile wi-fi device in case I can't get a good connection to the wi-fi at the location. For most researchers, the hardest part of working in the field is approaching strangers and persuading them to take part. And I'm no different. Saying that I'm from the government isn't a huge draw, but it at least let's people know that I'm not trying to sell them something. I've also had success giving people a ticket with a hand-written time, if they say they might come back later. So far I've run pop-up research sessions at a day centre for older people, a large library, a further education college and a youth parliament. 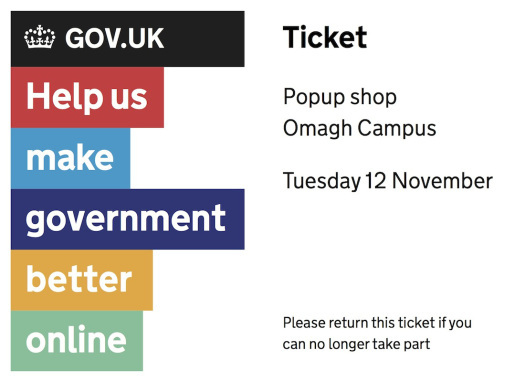 I'm currently planning pop-ups to try out our service with homeless people, students, the gypsy and traveller community, members of the armed forces, people with disabilities, and voters who live abroad. Look out for the banners. John, If you need a hand running pop up research for those living abroad I have my passport ready! Hi Ian, yes we've had a few jokes about research tours to the Bahamas. But current plan is a quick trip through the Channel Tunnel. From the links above, I can't find out anything about the progress of the ERTP. Could you provide a link, please?